Free fax to email used as a document scanner. Send documents directly to your email. Using your fax to email may be used as a monochrome document scanner. 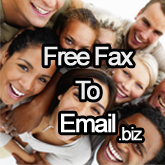 You fax your documents to your 086 fax number, the documents are emailed to you. The document is received as a pdf or TIFF document. Once you have received the fax, you may save it, forward it or print it.